Don Smith proved to be one of the first of a great line of defensive linemen to come out of the University of Miami. 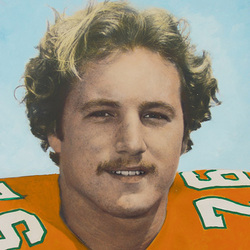 Don received Associated Press All-American honorable mention honors in his junior season after he led the Hurricanes in sacks, 10, and posted over 90 tackles. That same season he was named first team Associated Press All-South Independanbt and received Miami's MVP and Most Dedicated Player awards. Don was often described as a very quick, aggressive, and powerful defensive tackle as proven with his 17 tackles against Colorado and Tulane in his senior season. His leadership on the field earned the respect of his teammates when he was selected a team captain in his senior year. Don was drafted in the first round (17th overall pick) by the Atlanta Falcons in 1979 where he played until 1985 before finishing his NFL career with the Buffalo Bills.